The Sutro Baths ruins down at the cliffs of Land's End have attracted many a spectator over the year, and now they're about to get even more special with an important addition. They are about to get restrooms. It's part of a $5 million gift to restore the land, in partnership with the Golden Gate National Parks Conservancy. In addition to bathrooms near the ruins, a visitor's center will be constructed with vending machines and historical interpretive elements. Although the area is remote and separated from the City by the suburban Richmond district, Land's End has plenty to see. There's trails from the Cliff House to the Legion of Honor, dunes that reflect a time before San Francisco's settlement, and amazing views of the ocean and bay. Since it's rarely visited by city residents, it's one of the few places where you can still feel like a tourist without traveling too far. 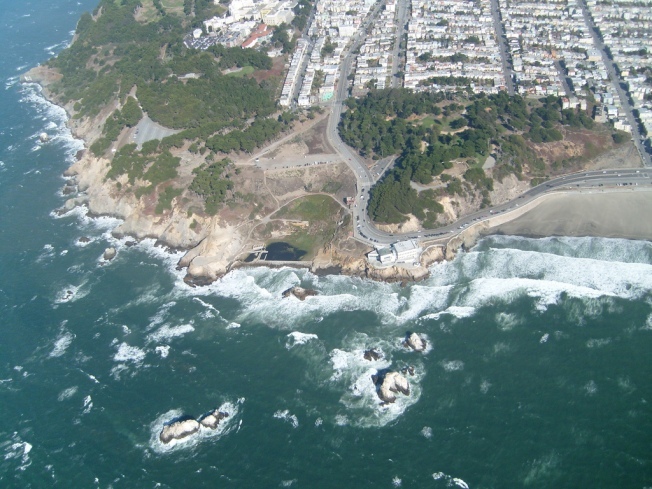 The Sutro Baths were once an enormous swimming facility located at the edge of the beach. Abandoned decades ago, it eventually burned down, leaving just a ghostly concrete footprint behind. The upgrades will also include repaving of an empty lot near a memorial to the USS San Francisco, but it's the visitor's center that's gotten the most attention. Representatives from the project have met with neighbors to listen to concerns, accept suggestions, and explain the timetable for construction. The project should be complete by this time next year. Thanks to millions of dollars donated in previous years, the area's already seen improvements. Volunteers smoothed two paths, planted thousands of native species, and cleared away debris.